and build one another up, just as you are doing. Her smile was so big that it lit up her whole face!!! When we first began to put her in the jumper she twisted around a little but wasn’t quite sure what to make of it. As she became more familiar with it she began to twist and turn and bounce up and down. Each time she accomplished a new feat we would clap our hands and say “Yeah, Avery!!! And she would look at us and smile that big smile with those irresistible dimples and sparkling eyes…she was so proud of herself! And all it took was a little encouragement! We all face those moments, hours or even days when our hearts take a nosedive and our world looks bleak. We live in a broken world where everything calls us toward selfishness and despair. Sin steals joy, our bodies break down, our plans falter, our dreams die, our resolves weaken, and our perspective dims. I remember a time in my life when my world was crumbling and I felt as if no one cared…not even God! On a trip to the mailbox I found a card with handwriting and a return address that I did not recognize. As I opened the envelope I read these words. “Dear Kay, I don’t know you very well or what is going on in your life right now but I felt that God wanted me to write this note of encouragement to you. I just wanted you to know that God cares about you and so do I. Please let me know if there is anything I can do for you. Love, Jane”…a short, simple note written over twenty-five years ago that I remember to this day as a turning point in my struggles. Encouragement may be given through one’s words or actions. Those words of encourage need not be eloquent or lengthy and actions need not be complicated…the important thing is that they are spoken or given. Encouragement is more than a popular trend in psychology. It has a spiritual dimension as well. The most common word for encouragement in the Bible is “parakaleo” – “para” meaning ‘beside, near, with, alongside,’ and “kaleo” meaning ‘to call or summon’. A paraclete is someone called along side of another to counsel, encourage, help and bring comfort. 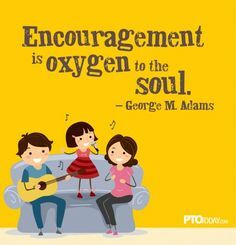 Scripture commands us to encourage one another (1 Thessalonians 5:11; Hebrews 10:23-25; Ephesians 4:29) and there are many examples in Scripture of people who were encouragers. God Himself encourages us through His Word and through prayer. Encouragement from the Bible gives us the will to carry on as we get a glimpse of the bigger picture. It can save us from believing lies and help us to experience the abundant life. So how do we go about obeying the command to encourage others? First, we must look around us and determine who is in need of encouragement. Maybe it’s a family member… a spouse, a child or grandchild. Words spoken by those who know them best and love them most are powerful. Maybe it’s a member of your church family. Being a Christian is not an insurance policy against pain, hurt or discouragement. Pray for them but take it a step further and give them a sincere compliment, share a time in your faith-walk when God proved Himself faithful or give them a hug and let them know you care about them. Maybe it’s a co-worker. Many of our co-workers live troubled lives at home. They smile on the outside only to hide the pain on the inside. Speak health and well-being into another life. You may never know how desperately it is needed. Or, maybe it’s a complete stranger…the waitress at the restaurant, the grocery clerk or the girl that does your nails. You may never know the impact your words will have on them but most likely they will never forget. Once we have identified someone in need of encouragement we can consider the most effective way to offer that encouragement. Pray for God to make you an encourager and show you who to encourage. Ask Him to give you a heart to build others up. Be intentional…even put it on your calendar if you need to until it becomes a habit. Think ahead and encourage based on what you see and hear. It may be something simple such as clearing the tables after a meal or if the individual is a believer something as powerful as making a comment on their faithfulness or demonstration of the Fruit of the Spirit (Galatians 5:22-23) in their lives. Be creative. Use a variety of methods to provide encouragement…a phone call, text, visit, note, scripture or appropriate personal experience. Be selfless. Don’t let fear, insecurity or time constraints inhibit your efforts to encourage others. We have a choice to be selfless or selfish in our encouragement. Encouragement is powerful. God commanded His people to encourage one another because He knew we would need it. Jesus warned that “in this world you will have trouble” but He followed that warning with a much needed encouragement: “But take heart; I have overcome the world” (John 16:33). Truth to Claim: God wants us to encourage others. Application: This week find one person and encourage them. It doesn’t matter who it is. Simply find a person you know who needs encouraging and gently encourage them. Then try to build it up over time. Two next week, three the week after – whatever feels comfortable. Try eventually to get to a point where you’re encouraging at least one person each day.